I love this breakfast because it can be made the night before to save precious time in the morning, and it lasts 2 days in the fridge. It starts the day off right, with 16g of Protein and 14g of Fibre; along with the added nutritional benefits of the very antioxidant and vitamin rich Acai and blueberries. Bananas are good for bowel regularity and satiety, and the chia seeds themselves are very high in thiamine and niacin, calcium, iron, magnesium, manganese, phosphorus and zinc. The creamy texture of the chia pot works very nicely in contrast with the crunchy granola topping too. · In a bowl, mix the Chia seeds, the brown rice syrup, the vanilla extract, the Greek yogurt and the milk; making sure they are well mixed. · In the meantime, heat 1tsp coconut oil in a medium saucepan. · Slice the banana, and add it to the saucepan along with the blueberries. · Stir frequently and once the bananas have started to caramelise, turn off the heat and mash. · Add the Acai powder and stir through. 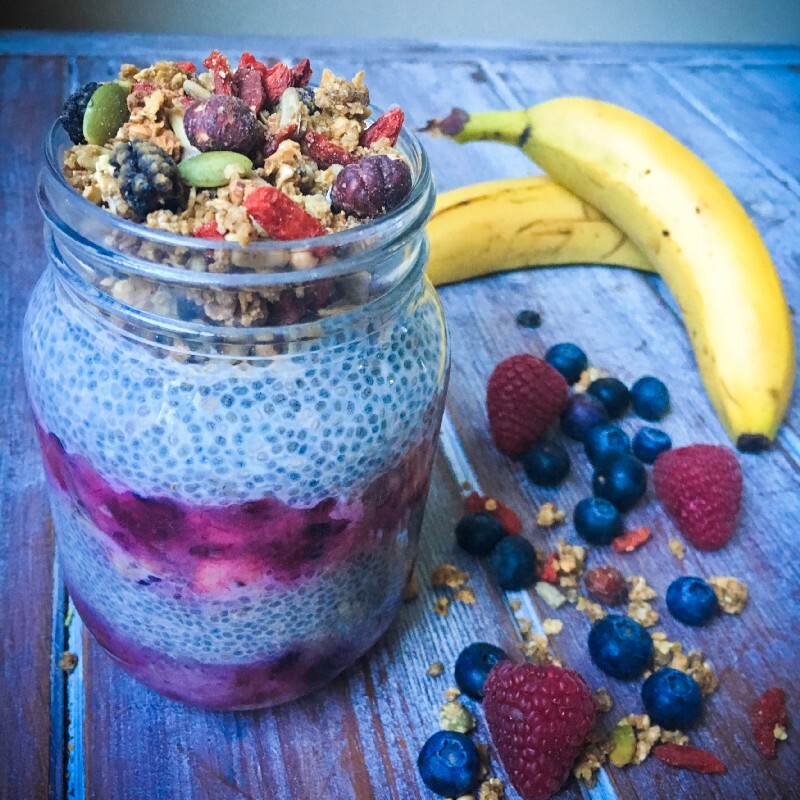 · Put ½ of this fruit mixture in the bottom of a glass jar and add ½ Chia seed mixture on top. · Once the Chia has set slightly (approximately 10 mins), layer with the remaining caramelised fruit, and then the rest of the Chia seeds. · Put in the fridge overnight. · The next morning, add 1 tbsp of granola and enjoy!